Tesla's newest electric vehicle is getting closer by the day after invites arrived detailing the Model X's launch event. The innovative company's third such vehicle has been teased out on an invite to the Model X Delivery Event with the trademark falcon doors giving a pretty good idea of what we can expect at Tesla's California factory come 19:00PST on September 29. 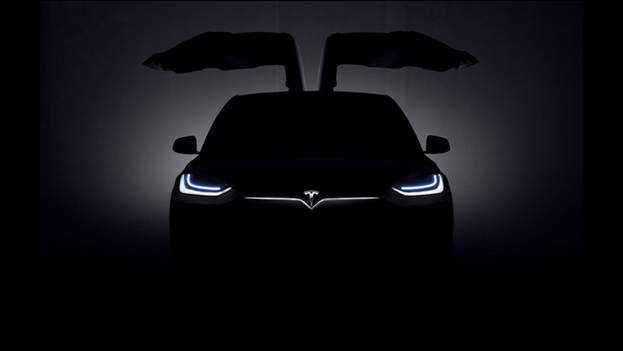 In addition to the falcon doors, the event invite also depicts a silhouette of the entire car with the signature front LED lights illuminating the increasingly more common Tesla Motors logo. Details on the Model X are hardly scarce and the family vehicle uses an electric all-wheel drive power train that was found in the 'D' versions of the nippy Model S. It will add a tougher suspension beneath this and a taller chassis, however, the width and wheelbase are exactly the same. Range-wise, there is nothing official as yet and estimates have mentioned something between 230 and 265 miles due to the increase in weight that comes from being a larger vehicle. Early deposit holders have already been able to spec out their own version of the Model X 'Signature' model that is a fully specced limited edition and will arrive in the garages of those lucky enough to have ordered one on September 30. Whether there's more to the event than that is unclear and pricing, which will be released during the event, is expected to come in at the same level as the Model S thus putting it out of reach of the regular consumer for the time being at least. The best SUV to pick up the kids from school? It'll even drive itself eventually.